Helping kids with sensitive skin. Our top tips for caring for kids with sensitive skin. Sometime before her gummy smile was taken by her first tooth, my daughter lost her soft baby skin. Milky cheeks turned raw and red from the slightest chill in the air. Her calves were coarse to the touch, seemingly devastated beyond repair. It is difficult to see my daughter in discomfort, her skin sometimes so irritated it bleeds. However, though my daughter’s sensitive skin causes her some distress, skin sensitivities can often be so great as to bring young sufferers to constant tears. Mariela tries to ensure that her daughter&apos;s sensitive skin is well cared for. Image: supplied. 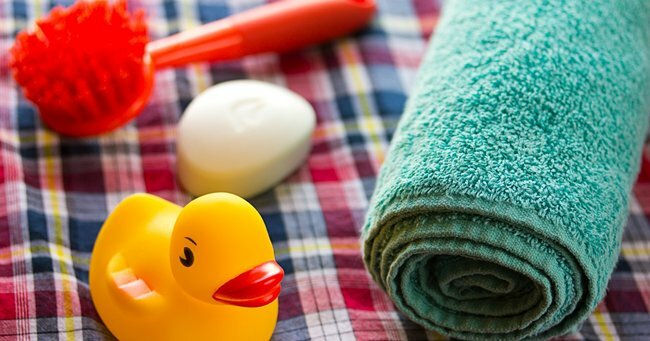 For parents who may have never experienced sensitive skin themselves, it can be disorienting reading so much conflicting advice on how to best care for your child’s skin – as it was in our household. After speaking to sufferers of eczema and other skin sensitivities, and their experienced mothers, I’ve compiled the list below - five rarely-disputed, highly successful tips for parenting kids with sensitive skin. One in two Australian consumers claim to amend their purchasing habits to accommodate a family member at home with skin sensitivities. Manufacturing companies, now well aware of this, will often have their personal care products dermatologically-tested, and accordingly labelled. Lotions, soap, powders – it is now easier than ever to determine the products that will be kind to sensitive skin, and those that will not. Beyond personal care products, I always try to be mindful of the products that are going to come in contact with me and my little one’s skin. For me and my family, laundry detergent can be the culprit of irritated and inflamed skin on my young ones. New Cold Power Sensitive contains almond milk, and has been dermatologically-tested. So not only does Cold Power give superior washing performance, but it is now giving me the peace of mind I need when washing the clothes for everyone in my family. 2. Minimise the presence of dust. Dust is best known to be detrimental to a small body for reasons relating to breathing. In fact, it also wreaks havoc on sensitive skin. Though I know you vacuum your home thoroughly, there are still things you can do to prevent the build-up of dust in your child’s most inhabited environment. Get rid of fluffy toys that gather dust where they sit. Get rid of excess blankets in bed, the ones pooled at their feet from a month ago when the seasons changed. Constantly change and wash clothes and beddings. If you rent, look for tiles or floorboards in your next home. Dust cannot get trapped on flat floor coverings, and shows much more than it does on carpet, making it much easier to know when a mop or vacuum is in order. If you own your home, and your toes are currently planted in plush carpet as you read, consider making the change – not to mention, wooden floors never hurt the value of anyone’s property! "I always try to be mindful of the products that are going to come in contact with me and my little one’s skin. Clothing included." Image: iStock. A friend who was plagued with severe eczema as a child moved interstate for some time. The difference in quality of air and proximity to sea water gave her enough respite to warrant the move, at least in her parents’ eyes. Now living back in her hometown, my friend has found an affordable and much less drastic alternative. Baths. Forget bubble bath products though, that often do more harm than good to sensitive skin – these baths are in salt water, oatmeal, milk or guava leaves. Baths that are rich in natural ingredients have an ability to either cleanse or hydrate. Have your child soak for ten to fifteen minutes (or until fingers get wrinkled, the age-old indication you’ve bathed long enough! ), and don’t worry about rinsing – just gently pat your child dry with a soft towel. Tip: Put your towel in the dryer prior to getting your child out of the bath. The towel, now warm and soft, will be less likely to be scratchy on ruptured skin. 4. Protect skin from the elements. Slip, slop, slap. The mantra of every parent and teacher from my childhood, is now one that I adopt when taking my own children out and about. Harsh Australian rays contribute largely to the drying out of young, soft skin and cold winter winds do their utmost not to be outdone. As the keepers and guardians of our homes, it is possible to somewhat control the home environment, and its effect on our children’s skin – but once outside, we can control nothing but the way we dress and prepare our children to face the world. Ensure the shirt you slip on your child covers their body where the sun will most often come into contact – shoulders, arms, back of the neck. Slop on sunscreen, and several times throughout the day, making sure it is a moisturising sunscreen that has been dermatologically-tested. Lastly, slap on a hat. The best hats will protect not only the face, but also ears and neck – unfortunately not likely to sit long on an adolescent, or even a trend-concerned primary school-aged child. In such cases, a cap is better than nothing. On this point – clothes should be loose-fitting. Air should easily circulate limbs and torso, sweat being the enemy of skin sensitivities. There&apos;s nothing better than a soft, warm towel. Image: iStock. 5. Consult your family doctor. Lastly, as with all matters of health, consult your family doctor if symptoms persevere or worsen. If ever concerned about the severity of your child’s skin sensitives, it is worth discussing them with a professional who can inform you of the pharmaceutical interventions available to your skin-sensitive child. What are your top tips to help sensitive skin?